This version of my Swig copycat cookie is a bit of citrus heaven! The Lemon Lime Sprig Cookie is everything you love in a Swig cookie, but with a fresh twist… lemon juice and lime zest! Everyone who tries this cookie loves it and many have told me they prefer this to my traditional original Almost Swig Cookie. Have you made ABK’s (Almost) Swig Cookies? Or my chocolate version of the Almost Swig, The “Swagg Cookie” ? If so, you are an old pro at making this type of cookie. 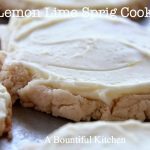 If you’re looking for an alternative to your usual dessert for Easter dinner, try this Lemon Lime Sprig Cookie! It tastes like spring in a cookie. Fresh, light and bursting with citrus flavors, this cookie is the perfect compliment to any meal. Years ago my sister in law, Diane, asked me about a dessert suggestion for a dinner with a Mexican-theme menu. I suggested she try adding some lime or lemon to the Almost Swig recipe for a treat that would compliment her meal. I was so intrigued with the idea that I decided to experimented at home so I could share a recipe with you. I tried putting lemon and lime in the frosting, but didn’t love the way the frosting looked with flecks of green. So I grated a bit of lime zest in the cookie dough, then made a fresh lemon and sour cream frosting to top off the cookie. Oh my. This Lemon Lime Sprig Cookie is out of this world delicious. Using fresh vs bottled lemon juice is a game changer in this Lemon Lime Sprig Cookie recipe. The difference between bottled lemon juice and fresh squeezed, especially in frosting is kind of like the difference between a can of orange flavored juice and a glass of fresh squeezed OJ. Oh, don’t worry you won’t need 20 lemons (photo below), one lemon will do! After several test batches, the cookie was ready for sharing. I gave the cookies to several friends and neighbors for review. Taste tester comments ranged from “OMG WHAT IS IN THIS COOKIE??!!!!! !” to “Best cookie I’ve ever eaten”. Over and over again people have told me this is their ‘top of the list’ favorite version of my Swig-style cookies! The grated lime zest and fresh lemon juice sets this apart from other citrus flavored cookies I’ve tried in the past. I know you’re going to love baking up this Lemon Lime Sprig Cookie. Preheat oven to325 convection or 350 regular bake. Take butter out of refrigerator and microwave for about 15 seconds. Place butter, shortening or oil, cold sour cream and lime zest in a mixing bowl. Mix for about one minute. Add sugar and almond or vanilla flavoring, mix until smooth. Add all dry ingredients at once. Mix just until flour disappears and the mixture comes together in a ball of dough, about 1-2 minutes on very low speed. Spray the cookie scoop with a little cooking spray. Scoop the dough onto a cookie sheet. I use either a 1 3/4 inch or a 2 inch scoop. A two inch scoop will produce a cookie similar in size to the Swig cookie. If you don't have a cookie scoop, roll the dough into a ball about the size of a golf ball. Flatten the cookies with the bottom of a glass dipped in sugar (press the bottom of the glass against the cookie first, then dip it in the sugar so the sugar will stick) .Press the cookies so they are flattened a bit, twisting the glass as you press to produce a jagged edge. Bake in oven for about 10-12 minutes or until edges are lightly golden and cookies are slightly firm to the touch. Remove from oven, let cool. Place the cookies in the fridge and chill. Prepare the frosting: Beat together the butter, sour cream, powdered sugar, lemon juice, zest and salt. When all ingredients are incorporated, add the drop of food coloring and milk if the frosting needs to be thinned. Frost after the cookies are completely chilled. -If you want the cookies to taste more like the Swig cookies make this adjustment to the dough:omit the almond flavoring and reduce the sugar to 1 cup. I prefer the cookies to be a bit sweeter, so I liked 1 1/2 cup of sugar in the dough.-I use a microplane grater to grate the zest.-The Swig cookie is frosted with quite a thin layer of frosting. I prefer my frosting to be a bit thicker. If you want to frost the cookie with a thinner frosting, add about 3-4 tablespoons of milk to the frosting.-This cookie stays quite well in the fridge for two weeks if kept in an air tight container. 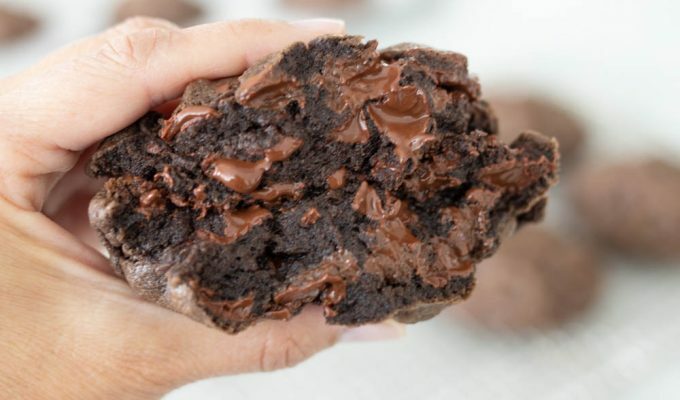 I almost always have a cookie sheet filled with these in my fridge for emergencies 🙂 They taste as good after two weeks as they do on the day they are made. These are a great choice to have as dessert at Easter. If they last until dessert in my home. You'll love these Lindsay! I know, I do have a slight cookie obsession. You are very welcome, but if you received compliments, it is because you ARE a great cook! Glad you loved this recipe Misty ! Sy – I just had my first Swig cookie while in St. George this weekend…pretty good but I think I'm going to like yours better 🙂 I LOVE sugar! Have you tried this recipe with the Smart Balance marg like Kurt C uses? Also – what about using cake flour? I have not tried Smart Balance. I really prefer the taste of butter, and don't mind the shortening mixed in for the crunch factor. I think the cake flour would take away the crunchy edge, but not sure. The cookie will have a different smell if you use cake flour as well. Have you noticed that when using cake flour? It gives off the smell of a sweet cake. Anywho, I'm not a huge fan of Smart Balance, but I do love Cutler's Sugar cookies! Let us know if you try any variations. Do you have Insta? post a pic there with the tag #Abountifulkitchenrecipe Love to see a photo! Thanks Sy! BTW – do you frost them when you leave them in the fridge or do you frost them when you need them and leave the rest unfrosted until needed? Thanks Sy! You're the BEST!!! I just tried the swig cookie while driving home to ca. ( I had the st. George version) I thought they were yummy! But I can't wait to try this one. We love citrus cookies at my house. Thanks for the recipe. You're going to love this cookie Amy! Amy, I'm glad you loved the cookies and the frosting! I think the little bit of sour cream really sets this recipe apart from most other frostings. And the fresh lemon juice makes all the difference! Thanks for letting us know. Happy baking! Hi Si, is the flour measurement right at 4.5 cups of flour? Yes the flour measurement is correct. I doubled my original recipe for the (Almost) Swig Cookie when I wrote up this recipe because I like to have several on hand. This cookie recipe consistently makes 18 large cookies I'd say about 4 inches across. I use a 2 inch cookie scoop. Once the cookies are flattened a bit, they do not spread much while baking. 4 1/2 cups of flour sounds like a lot, but the cookies have 2 cups of fat (yikes!) if you count the butter, shortening and sour cream together. Under-baking the cookies and the high fat and flour content makes the extra dense texture everyone loves! Would the frosting work with lime zest? I don't have any lemons but I do have lots of limes. I didn’t love the way lime zest looks in the frosting, so I use lemon. The ingredient list has almond extract listed, but the directions say to add vanilla. Which is correct? I have not tried the peanut butter Swig cookies, but I will next time I get a drink! Are you measuring your flour by lightly spooning it into a measuring cup? Or scooping it out if the flour bag? Thanks. I just scoop the flour out of the container! Well these turned out delicious. I loved the lemon lime flavor. Going to have to share with friends so I don’t eat them all. I think I prefer these the best out of all the swig cookie flavors. To what you refer when you ask for lemon food coloring? Food coloring that is yellow?Or food coloring that tastes like lemon? Either way, what specific product did you use? Thanks! That was a typo, which was never caught the first time the recipe was posted. I fixed it to say yellow food coloring. Thanks so much! Can this be rolled out and cut with cookie cutters or does that mess with the texture? I haven’t ever rolled this cookie dough out. That’s the beauty of this recipe no rolling! If you want to make a roll and cut cookie, try the Cutler’s recipe on ABK. what if I used all butter rather than part Crisco or canola?? The butter flavor Crisco helps this cookie maintain it’s shape. I have found half butter and half Crisco works well for the Swig cookie. Let me know if you try all butter!